Another year we moved to the World Show, on October 27 and 28, 2018 this year was in Tampere, Finland, our first exhibition in a Scandinavian country. We went with our beloved Malattodolls Charlie, and the results were very satisfactory, Charlie was very close to the nomination, among 7 cats of all category 1 and in class 12 he was second, competing with very nice kittens. 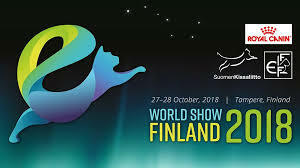 As every year we came back to coincide with many friends and breeders from all over the world, but this year was special because it was my first World Show as steward of the best experiences of my life, besides one of the cats that I showed in the final panel was WW 18 a nice British Shortair Blue, a more experience!